The hard part is over….but is the story? No. A good story really never has an ending, it continues on and on creating new stories along the way. So where have I been? I mean you probably saw my post about my dad or my post about our great time at Camp this year with our youth. You might have even seen the two Disney posts that came into play. But what about cancer? Is it gone? Are you done? The answer is no cancer is never done. That sounds a wee bit morbid, but it is true. This summer has been so full and my life has been so busy since being pronounced in remission that I have really not stopped to reflect on what it is like to live without cancer. Well the truth is that I am still living in the cancer world even after remission. Part of the original plan was to have 8 chemo treatments and then do radiation therapy as a precaution. I am almost at the end of my radiation regime and for the most part it has been uneventful. Here is how the process goes. Everyday for the past two weeks I have arrived at the cancer clinic during the 8 o’clock hour. I sign in the main lobby and sit in the waiting area that contains lots of natural light, two tvs, and lots of seating with that vinyl covering instead of fabric. In my mind I imagine the staff taking each chair outside and hosing them down then letting them dry in the sun. They are not too comfortable. The tvs however are. It’s odd to say that a television can be comfortable, but one of them is always on HGTV and the other is always on the Food Network. Those two channels are arguably the best chill channels to watch on cable. I have started fixing myself a thimble of coffee everyday as I wait. I do say thimble, because that is about the size of the cup. The first few days took some time, but since then I just fly right through. Two weeks ago I entered into the bomb shelter-ish radiation room and was laid on a table. What is really nice about my clinic is that on the ceiling there are a few tiles that just have pictures on them instead of a boring old tile. The picture in my room is of a garden. Think Mynelle Gardens in Jackson. I like to imagine that it is Buschart Gardens in Canada, which I have visited once when I was 18. Anyway, they lifted me up on the table and positioned the machine over my chest. 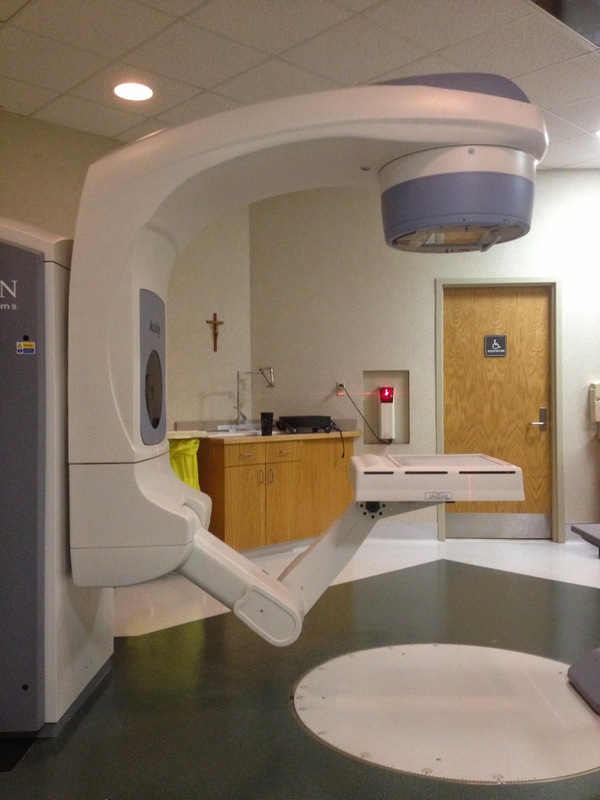 This radiation machine is pretty incredible. It produced lines on my skin with lasers so that the radiation techs could draw marks on my skin to make sure they always zapped me in the right place. I have now had those same marks for two weeks. They iched at first, but now they are just my cancer henna. The actual process of radiation is fairly simple to live through. You lay down on the board with a contoured head rest, a toblerone looking pillow to go under your knees, and then a foam rubber oval that goes over your feet to make sure you down just click your feet the whole time (I am sure I would if I could). After a few days they started giving me another foam oval to hold in my hands, I guess I was moving around too much so they took pity on me and gave me something to hold. After I am all set with my various foam accessories, I am adjusted into position. Everyday they call out 95.3, which I suppose is some position that the machine recognizes as my setting. Everyone leaves the room and I am staring into the circular machine staring straight back at me. I stare at myself in the reflection of the dark void of the machine until someone places a steel plate that is located between myself that the rays of radiation. So there I am, alone in the room. Just me and the machine. Then a loud noise hits my eardrums. I can see out of the corner of my eye a sign that looks like it is straight out of a radio station. Instead of saying On Air, it says Beam On. I make believe that I am some super hero being blasted with radiation rays of power, but in all honesty I don’t feel a thing. I don’t feel warmth or pain. The only thing I do feel and I can’t decide if it is real or all in my head is my sinuses being cleared out by the beam. It is as if all the mucus is racing away from the beam and back up into my head. Kinda gross but thats the best way I can describe it. Once I have been hit from the top the machine head rotates and the steel plate is removed and I am then blasted from the bottom. The beam is on for a grand total of 8 or so seconds, but it feels like an eternity. I am then lowered and the accessories are removed. I then say goodbye and grab my things to leave. Pretty simple. Sometimes when the beam comes on, I want to scream, “no stop thats too much!” But I never do. I wish I could spin this discussion into something more meaningful and insightful, but the fact is that the process is so fast, I never really have time to think about the impact. It has become a little routine now. One that is not too disruptive or inconvenient, just another part of daily life. If chemo was a marathon, radiation is doing a little bit of jogging every day. You get tired of running a marathon in the middle of it, but doing a little jogging everyday doesn’t really seem to wear on you. Well this week the jogging caught up with me. I noticed this weekend that I was developing a sore throat. Kinda felt like allergies/strep. Felt like it was no big deal. Well on Monday, I could barely get down food without tears coming to my eyes. The pain was so bad that I was wincing in pain with every swallow. Good thing I was eating lunch at Brent’s in Jackson, because I ordered a milkshake to finish out the meal and it went down SO well comparatively. Since then the doctor prescribed some liquid narcotic and I picked up some chloraseptic and throat losenges for extra help. Eating is better, but it still is painful. Maybe I will live on soups for the rest of the summer. I guess this all goes to show that just because you do something a few times and it does not harm you, does not mean that in the long run it won’t harm you. I went into radiation thinking oh this will be a breeze and I never gave it the respect it deserves. I am preventing a recurrence of cancer, radiation IS a big deal. So you got my attention radiation! Now if you would kindly let me eat food that would be great. Another hit was that I found out today that I am not scheduled for 3 weeks of radiation, but 4 weeks of radiation! What’s one more week not being able to eat right? I must be honest and say that the pain in my throat was a shock to my system. I was so used to feeling “normal” again that I sort of forgot what it was like to hurt again. Don’t let your guard down and just let life pass by you. Don’t just go through the motions. Be aware and diligent in your walk and talk. You never know when some big moment or event in your life will happen and call you to action. Radiation called me into action again and I must tell it that God will prevail. I could lose hope and get sad about the pain and have a terrible and unproductive two weeks OR I could gain hope and press on towards the goal of ending radiation and cancer treatment with a smile on my face. Let me tell you that I got completely complacent. Completely complacent in my walk with Christ, in my prayers for others, in my words towards others, and in almost every other part of life. I am far too guilty of getting a prayer answered and then forgetting about God for about a month. Yes I still attend church and pray and maybe even lead bible studies, but again I am just running through the motions. I want my walk with Christ to be dynamic and alive at all times. I am just now getting ready for school to begin again. And some of you know that getting a teacher back in the swing of things after a few months off is tough. It’s tough because we get rusty and lax during the summer. But if we are in the middle of the school year, it is hard to slow us down. Thats how I want to be in my walk with Christ. Sorry for the long post, but I hope my point is clear. Don’t get complacent in your life. Life is too precious to just sit on auto pilot. Get out there and be ready for whatever new experiences both good and bad await. I definitely was not prayed up for this experience, but through this I have learned how to be ready. Thanks for reading.